It’s a Beautiful BABY! 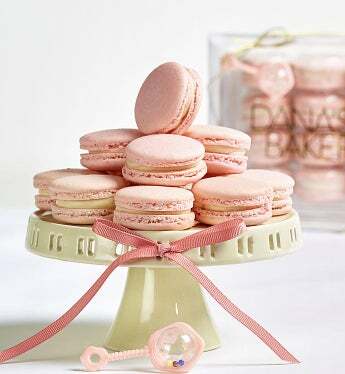 These pink or blue macarons taste amazing and are the perfect gift for any parent-to-be, they will also sweeten up any baby shower! Celebrate the arrival of a new baby with this special 12 piece gift box festively tied with a cute rattle decoration. Choose Blue Tie Dye Cotton Candy or Pink Strawberry Shortcake Flavor. Kosher OU D.
It’s a Beautiful BABY! These pink or blue macarons taste amazing and are the perfect gift for any parent-to-be, they will also sweeten up any baby shower! Celebrate the arrival of a new baby with this special 12 piece gift box festively tied with a cute rattle decoration. Choose Blue Tie Dye Cotton Candy or Pink Strawberry Shortcake Flavor. Gluten free too! - made with almond flour. Kosher OU D.